1. The core principle of user-friendly GUI design is simplicity. Any extraneous controls or notifications must be systematically eliminated to reduce distractions and improve operator response time and accuracy. Form must follow function. When design is kept simple and shaped by the needs of the user, the resulting product will be functional, intuitive, and aesthetically pleasing. 2. The interface must also be purposefully designed with the user's execution objective in mind. To create a task-oriented GUI, it is critical to first answer two questions: what does the operator need to do, and what is the minimal information that he or she needs to take those actions? Only after answering these questions is it possible to create an interface that is truly useful to the operator. 3. Finally, with any GUI design, it is important to anticipate a spectrum of technical proficiencies, experience levels, and ages. Ensure that buttons are large and clear and that text is simple and legible. However well-crafted your design may be, do not simply assume that it will be intuitive to all users. Provide multiple ways of performing each function and include embedded tooltips and guides wherever possible. Cindy Davis is a regular AV Technology magazine contributor. 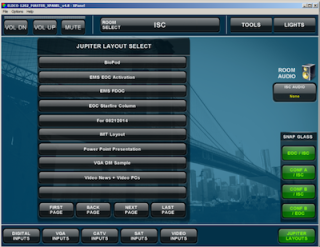 GUI image courtesy of the FDOC, featuring Jupiter.